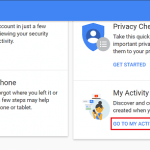 You are here: Home / Delete Social Media / How to delete WhatsApp message? Have you ever felt that you so want to delete WhatsApp message because you sent it to the wrong person or in an unintended group by mistake? You might have sent some impulsive message in WhatsApp to someone in anger or any emotion, and after sending the message, you realized that you shouldn’t have done so or you feel embarrassed about it. You need not worry and be embarrassed anymore. 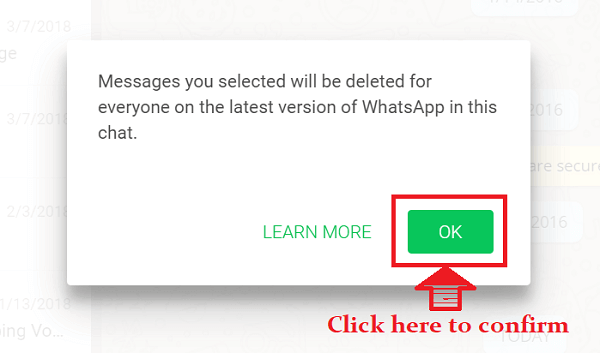 Now you are allowed to delete WhatsApp message that has been sent to the wrong receiver in such a way that the receiver will not be able to see the message. However, at the receiver?s end, the deleted messages will be displayed as ?The message was deleted?. This is one of the great features added by WhatsApp following the footsteps of Viber messaging app. But unlike Viber, you cannot delete old messages for all. WhatsApp allows you to delete sent message just within 60 minutes after the message is sent. It is not possible to delete a sent message that is older than 60 minutes in a normal course, but we will provide you a cheat code to delete WhatsApp message sent to the wrong person even after the passage of 60 minutes after sending the message at the end of this article. 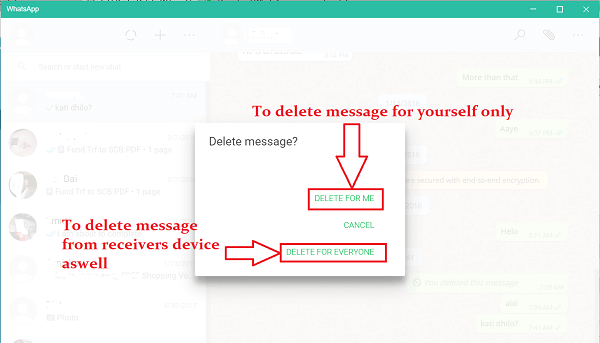 In this article, we will discuss the process on how to delete WhatsApp message for yourselves or everyone. Open WhatsApp: Open WhatsApp in any of your devices. 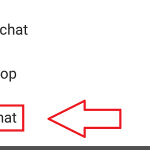 You can open WhatsApp either from your mobile or your PC if you have enabled WhatsApp on your desktop/laptop or tab. Find the message you want to delete: It can be the message sent to an unintended person or the message sent to the unintended group by mistake or any impulsive messages. If you are using internet browser:- At the side of the message, you will see a downward facing arrow. Just click on that. If you are using a mobile application:- Tap and hold the message that you want to delete. After you click on downward facing arrow (or tap and hold the message in case of the mobile application), a drop-down list will appear. From among the list click on “Delete” option. 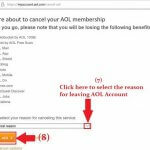 Once you click on delete three options will be seen. Delete for yourself, Delete for everyone or cancel as seen in the picture below. However, notice that if it has passed 6 minutes of sending the message the option “Delete for everyone” will not appear. If you want to delete message for everyone click on “Delete for everyone” option otherwise click on “Delete for yourself”. 6. A confirmation window will appear if you click on “Delete for everyone option”. 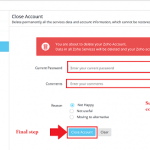 Click on?“OK”?to confirm to delete message for everyone permanently. How to Delete Multiple messages in WhatsApp? Open WhatsApp on PC/tablet or your mobile phone. Find the person or the group whose message you don’t want to appear on your device. Now press and hold the message. Once the message is highlighted for deletion tap on other messages you want to delete. As you select all the message to be deleted, tap on the delete icon (bin icon) at the top of your screen. A confirmation message will appear. Tap on OK and all the messages you have selected will be deleted from your device. Open WhatsApp on your device. Find the person or group whose entire messages you want to delete. Without opening the message tap and hold the message notification. As it is marked tap on delete icon. After that confirm the deletion and the entire message from the person will be deleted. Keep in mind that once you choose to delete you will not be able to get it back by any means. So think twice before you remove the messages in WhatsApp. If you want to remove a sent message in WhatsApp after 60 minutes, then follow these cheat steps. First of all turn off data of Wi-Fi on your device. Go to Settings, after that to ?Date and Time?. Now change the time in such a way that the time when the message was sent will be no more than 60 minutes ago. For Example: If the message was sent at 10:50 A.M then the time should be set to 10:50 A.M to 11:50 A.M.
After that go to WhatsApp messenger and then delete the sent message by following the procedure as mentioned above. Turn on wifi and check the WhatsApp messenger. The message must have been deleted. How to Delete Viber Message?